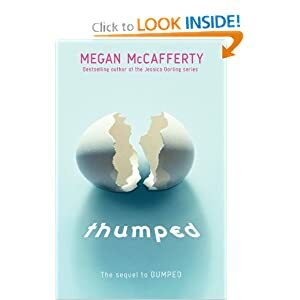 Last November, while at NCTE, I was ecstatic when I checked the program and realized I would have the opportunity to meet Megan McCafferty. I’ve been a huge fan ever since I read Sloppy Firsts (Jessica Darling, Book 1). Jessica and I are kindred spirits. I also read and reviewed Bumped when it was released. Megan doesn’t live to far from me but I’ve never been able to make it to any of her local signings. Needless to say, I was very happy that I would get a chance to meet her, even if it was in Chicago instead of NJ! I read Thumped as soon as I got home because I had a waiting list for it. My colleague, who teaches Biology, had really enjoyed the first book in the series, so I wanted to pass it on to him. I read Thumped in one sitting and absolutely loved it. Thumped is awesome. Absolutely awesome. I recommend the series to upper-YA readers and adults. In a culture where millions of people watch sixteen-year old girls give birth and raise their babies on TV, McCafferty has crafted a speculative dystopian world that resembles our own a little too much. You know the saying “too close for comfort”? That’s what McCafferty has crafted in these books. Thumped picks up about eight months after the first volume left off. Harmony is back with her church family and Melody is the pregnant girl. Think Beyonce’s pregnancy times a million. Her every move is calculated and tracked by her fans. Both girls are about to give birth, but it’s not as simple as it seems. Before either girl gives birth, they are brought together once again and some tough decisions are made. I can’t tell you much more because it will give it away. Just know that this is a book you won’t be able to put down once you start it. The best part of McCafferty’s writing in these books is the world building. The slang she uses is intense but you quickly slip into the world she has created and the language becomes your language. I know the word choice made it difficult for some readers to get through the first volume, but it’s really the best part of the book for me. And you know what else I love? The sarcasm in these books. People, I am sarcastic. Seriously. All. the.time. It’s a problem. And I know that there were some people who took issue with the premise of these books and seemed to miss the whole point- it’s a satire. But it’s the best kind of satire; the type that makes the reader really think. You will close this book and you will wonder how we can ensure this doesn’t happen in our world. I think teens will read this pair of books and think about the repercussions of having babies when they are still a child themselves. These aren’t books you can finish and file away in the back of your mind. These books are intended to make you think and think you will! Highly recommended for mature readers. As with the first volume, I’d recommend reading it yourself before placing it in a classroom library, but I think it is a valuable addition to any library. Definitely a high school book (and even college! ), but I wouldn’t recommend it for middle school readers. Why, for instance, does the story leap ahead fifty years in the last two pages? Why are the sentences so long in this story? Why would a writer risk confusion by introducing so many characters in the first two pages? Last year, I shared the summer reading list that my colleagues and I developed for our incoming 9th graders. Recently, our team sat down to hammer out summer reading. (nota bene: I am not a fan of prescribed summer reading, but I do believe that students should read during the summer. I believe in choice. Plus, my students are highly motivated and expect to read!) I wanted to capitalize on our inter-disciplinary team and I’m so thrilled with what we came up with. First, we decided to have One Book, One Class. All of the incoming freshman will be reading Brian Christian’s The Most Human Human: What Talking with Computers Teaches Us About What It Means to Be Alive for two reasons. First, Brian is an alum and we expect the kids to love that. Second, the book (review coming soon!) is a perfect composite of our cross-curricular team. It covers science, language, communication, computers, history, and so much more. All of the freshman will have this touchstone text and the teachers will be reading it, too. In addition, each student is asked to select one fiction and one non-fiction title from the list we provide. 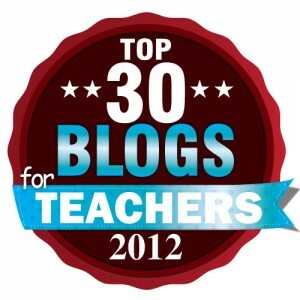 On the list, we also noted our own favorites, in case students were seeking guidance. I am thrilled with this list- it provides a wide array of choices in a variety of genres and across many levels (keep in mind my students are all accelerated, so while it is a 9th grade list, it may read more like a 10th-11th grade list). I recently finished updating the list for the class of 2016. I didn’t make too many changes, but I did add and subtract a few books to keep the list fresh. I also took into acocnt the advice my current freshman shared with me about their favorites from the list. You can find the updated list below. In addition, each student is asked to select one fiction and one non-fiction title from the table on the reverse side of this sheet. You are to read TWO of these books this summer for your BASH (Biology, Applications of Software, Humanities) courses. You must read one fiction book and one non-fiction book. We hope you enjoy your reading and look forward to discussing your thoughts when you arrive in September. The books listed above represent a wide range of choices and reading levels to meet the varied needs and backgrounds of all of our students. We trust each student to self-select the books most appropriate for them. Feel free to try out more than two choices in order to find the best books for you. This summer, I am running a camp for bookworms. Inspired by Thalia’s Book Camp, run by Symphony Space in NYC, I will be spending a week at our local community college with 7th, 8th, and 9th graders who love to read. Before camp, they will read Ashfall, Breadcrumbs, and Tankborn (I am so excited about all of these books!). Over the course of 5 days, I am planning to do a few author Skype visits, writing activities, mini book groups, and other activities connected to the books. I’m brainstorming as you read this. But something else I would love to do is connect with folks in the publishing world. We can’t go to NYC, but I’d love to have an editor, cover designer, agent, or anyone else in publishing Skype in for a few minutes and talk to the kids about their work. All of the attendees are guaranteed to be bookworms, but I doubt they have much knowledge about the process of making books. It would be a great experience for them! I’m hoping to reach out to people who read the blog. We wouldn’t take up much of your time- maybe 25-30 minutes? If you are interested in talking to the kids, it would be during the week of August 13th-17th. Please email me (thereadingzone@gmail.com) if you have questions or if you are interested. Thanks so much! *Feel free to pass this blog post around! Thanks! Despite working on my National Board portfolio almost non-stop during March, I did make time to read a few books and watch March Madness. March Madness is my favorite time of year and I love rooting for the Cinderella teams, the underdogs, the surprises. 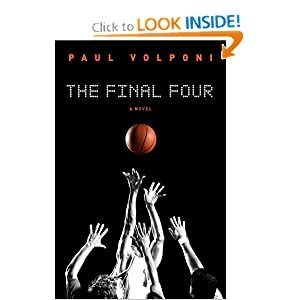 When I received a copy of Paul Volponi’s The Final Four from the publisher, I made sure that I put on top of my TBR pile. I read it between the second and third rounds and it was better than any game I watched on TV. This is a fantastic book and one I highly recommend for high school libraries. I also think it will appeal to middle school readers. The book is told over the course of overtime in a single Final Four game. The reader sees the game through the eyes of four individual players, with snippets shared from the announcers and newspaper articles. Malcolm is a boy from the inner city whose sister was killed in a drive-by shooting. He is only interested in looking out for himself and he is a one-and-done player, leaving for the NBA as soon as the season ends. MJ, Michael Jordan (the most unfortunate name for a boy who likes basketbal, who is trying to do well in school and make a better life for himself. Roko, a Croatian teen whose uncle was killed by the mafia in his home country, is trying to honor his uncle’s memory. Crispin is from Louisiana and is engaged to the head cheerleader, but suddenly isn’t sure it’s what either of them should be doing. All four players come with baggage and they all have to contribute in the final moments of the most important game of their life. The set-up is spot-on. I felt like I was watching the game and I was on the edge of my seat throughout the book. All four players ring true and the background information is great. And this isn’t just an action-packed story about a basketball game. Volponi forces the reader to think about the money and prestige that come along with NCAA basketball. Is it enough to “pay” college athletes with a free education when their school is potentially making millions off of their work on the court? Should college players be allowed to play a single season and then move into the NBA at 18 or 19 years old? Volponi is a great realistic fiction writer and all of his novels are must-haves for high school libraries. The Final Four is another slam dunk from Volponi and I can’t recommend it enough. Even those who don’t particularly like basketball will find themselves pulled into the world that is NCAA March Madness.